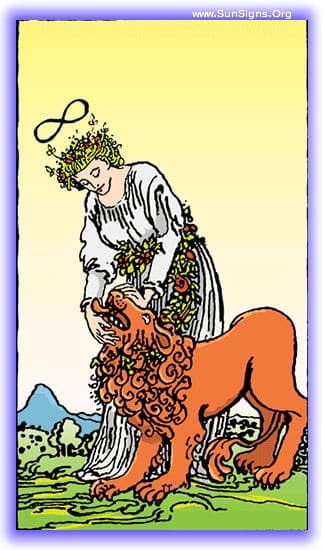 This tarot meditation using the Strength card upright will focus on confidence and power, the ability to overcome obstacles. As you set up the red cloth with its candle, and lay out the card, make sure your circumstances are as conducive to confidence as possible. Inspiring music can be played to put you into the right mindset. As you settle in to your meditation, within your mind you will see yourself standing at the beginning of a clear path. Your plan is to traverse this, and head forward to accomplish your goal, and reach your ultimately goal. You set forth, striding confidently on your way, knowing you will reach your goal. Almost immediately the rain starts to fall, but this is no great matter, you think. You take off your hat and enjoy the fresh rainwater on your head, cooling you as you journey. The rain continues to pour, and you hear the distant roll of thunder. But still you trudge on, it’s just a little water you think. As you continue walking, you see tree branches and such beginning to fall in the rising wind. Grateful for the gift, you pick one up, and use it as a walking stick to check the depth of puddles in the road, and as a prop to help you traverse the more difficult debris that has fallen across the road. Further on, you come across a river that has swollen and taken out the bridge, the water having eaten away at the shore. Looking at this momentarily, you realize that there is a tree near to falling over, most of its roots exposed. Placing your walking stick in it as a lever, you topple the tree, and it falls across the river, creating a bridge. With a jaunty smile at your cleverness, you stand and head to cross the river on the log. You walk across, your handy walking stick serving to steady you as it rocks gently in the river. Hopping down on the other side, you look back across the river, grateful to have successfully traversed the difficulty there. You look ahead, knowing that whatever challenges you face, you can turn them into a new opportunity. Nothing is beyond your grasp, and your goal is easily in reach, for a certain value of easily. It is, however, an eventuality, not a maybe. It’s just a matter of time. Confident in your journey, you head forward to your eventual prize. As you come out of this tarot meditation, carry this feeling of confidence with you. The feeling of knowing how to proceed is all you need with you at this point. Record whatever seems significant from your journey, anything that seems personal to you. Know that so long as you believe it, you can in fact achieve it, that’s what this Strength tarot meditation is all about!